Several different snake species live in the wetlands, ponds and rivers of the southeastern United States. One of these is the venomous cottonmouth—also known as the water moccasin. It can be difficult to distinguish cottonmouths from the many nonvenomous water snakes of the region without getting dangerously close to the unknown snake. Fortunately, by observing a snake’s swimming behavior, you can distinguish cottonmouths from harmless water snakes. Cottonmouths (Agkistrodon piscivorous) inhabit a variety of aquatic habitats along the coastal plain and into the piedmont of the United States, from Virginia to Texas. Cottonmouths prey on frogs, fish, snakes, rodents, birds, salamanders and invertebrates, capturing these animals with the help of their potent venom. Cottonmouths reach about 4 feet in length, and produce live young in the fall. They are pit vipers with two small pits on the front of their face that detect infrared light—heat—from their surroundings. Cottonmouths and their close relatives the copperheads (Agkistrodon contortrix) frequently hold their head at a 45-degree angle. 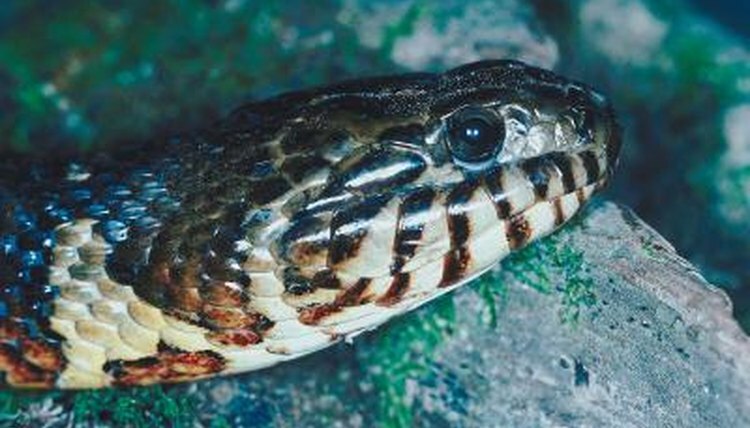 This behavior may be associated with the defensive use of their facial pits; by aiming their heads upward, the snakes can better see looming, warm-blooded predators. Additionally, as cottonmouths frequently exhibit gaping behavior at predators, the elevated head posture may help them to engage in this tactic. All snakes can swim, and most species do so quite well; nevertheless, some snakes are better swimmers than others. Some snakes—such as the completely aquatic sea snakes—have paddle-like tails and dorsally placed nostrils, while other species do not exhibit such extreme morphological adaptations for swimming. Regardless of their morphological adaptations, most snakes swim in essentially the same way—by undulating from side to side, while using the tail to provide propulsion. While cottonmouths and water snakes both swim in essentially the same manner, there is one important difference. Cottonmouths are very buoyant snakes that usually float while holding their heads high out of the water. Conversely, water snakes typically swim at or under the surface of the water, with their heads level with their bodies. Exceptions exist, however. Water snakes may float or swim at the surface of the water, and at times cottonmouths will swim underwater to capture fish. Perhaps unsurprisingly, the cottonmouths’ cousins, the copperheads, often swim in a similar manner. The University of Georgia: Is It a Water Moccasin?